Sculptor, painter, builder, foundry man, bag piper. He built his beautiful REAL log cabin which took him 3 years to build. He built all the structures atop what he calls his “Scott’s Peak” and named his cabin my “Brig-O-Doon” – his “DREAM” cabin. John even built and operated his own foundry becoming an experienced foundry man. John was born on the hot plains of South Dakota on July 29, 1919. To parents, John Scott, his father A “Scott” and to his mother, Goldie (Bruce) Scott, a “Bruce” both of whom were of Scottish descent. A descent of which John is extremely proud of. He learned to play his bag pipes and plays them while wearing his Clan Scott tartan Kilt. He greatly enjoyed playing them. At his advance age he had to quit them. It is difficult as to where to begin in his long and varied life. With having a wide range of occupations and professions; from dish washer to cost accountant, from construction to insurance agent, from dry dock worker to traveling salesman – and more! 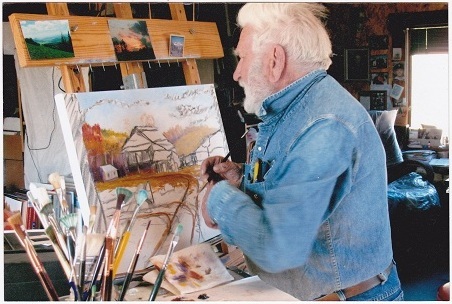 John has spent the last several years of his 96 years pursuing his art career. He has created over 100 bronze images. Every sculpture John does is done with painstaking attention to detail and correct anatomy of the subject. 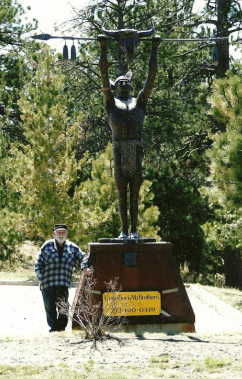 His most creative image being his 13 foot Indian he called “Come Back My Brothers”. This he sculpted out of a dead Elm tree. When he finished he found the tree had died in its 65th year and John had finished his work when he was 65 years old! He has created over 90 pewter images, painted over 80 original paintings and produced over 250 Mystic Mytes. Those fascinating little figures create themselves under his wax recovery hot plate. He has had many art shows and exhibits. John has been interviewed by several TV shows and has had many news articles written about him. John’s been an avid nimrod (hunter) and has harvested many large game animals from a huge Moose in British Columbia to a Dall Ram in Alaska and many large game animals in Colorado and Wyoming. Anyone wishing to visit his “art complex” for an exciting day of culture may do so by calling for an appointment at 303- 674 -1864 and John will be pleased to show off all he has built and how he has created it all.